Roasted Butternut Squash Soup is a cold-weather staple! 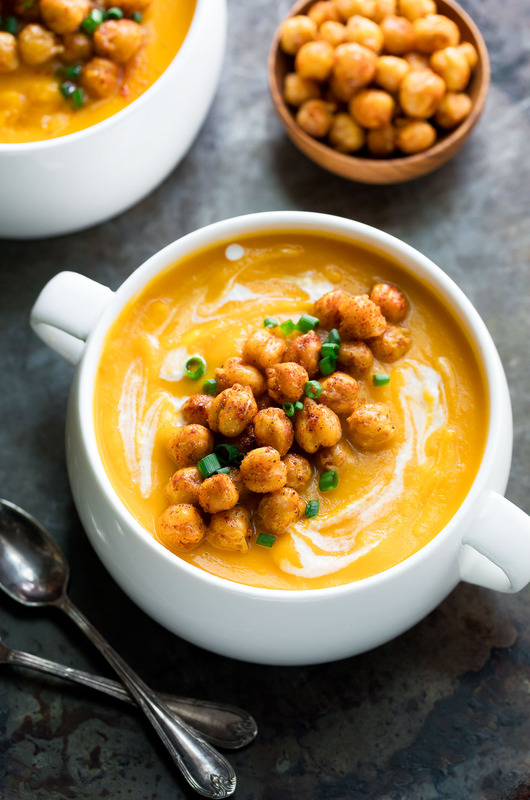 We love this silky butternut soup served with spicy roasted chickpeas for extra flavor. Vegan, Vegetarian, and T-Rex toppings available, so there’s something for everyone! Roasting the butternut squash until caramelized and tender is totally key here. The flavor blows any other method out of the water. To capitalize on extra flavor and also streamline our squash-to-soup process, let’s just go ahead and roast some carrots and onion along with it! A velvety, flavorful soup that is so crazy tasty you won’t be able to put down your spoon! To me, this baller butternut soup tastes like Thanksgiving in a bowl. As an added bonus, the roasted veggies made my house smell so completely divine! I have a feeling we’ll be making this one a whole lot this Fall + Winter. Love it so! Looking for some extra ways to season your soup? Aside from salt and pepper, you can also add nutmeg, allspice, ginger, and/or cayenne pepper. Fresh sage and sautéed or roasted garlic are popular pairings as well! I like my soup on the simple side, so I spice the soup accordingly. A little salt, pepper, and sautéed garlic with some spicy seasoned chickpeas on top and I’m as happy as can be! I seasoned my crispy chickpeas with smoked paprika, garlic powder, cumin, ground cayenne pepper, salt, and pepper. They were so tasty right off the pan that I literally had to force myself to save enough for the soup. They lend some flavor to the soup as well, making them a healthy + crazy tasty topping option! 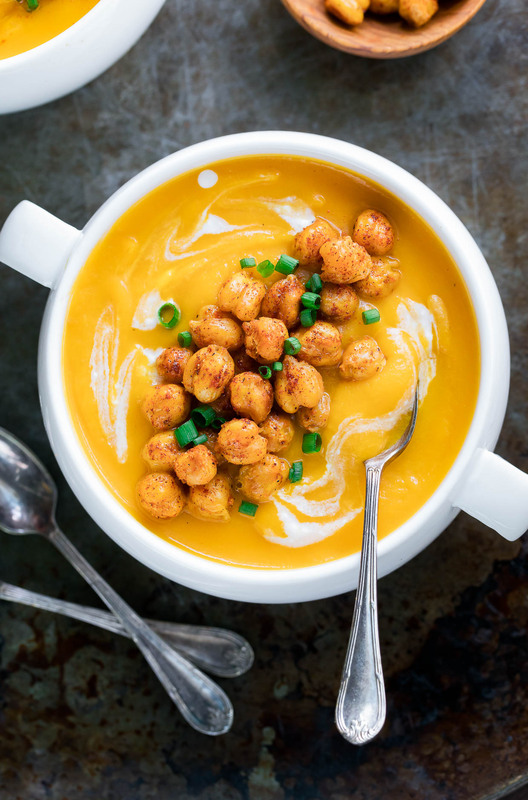 what toppings can you add to butternut soup? If you’ve been waiting this entire post for me to mention bacon I totally get it! You’re welcome to top the soup with crispy bacon if you’re jonesin’ for some. Vegetarians can opt for vegan bacon bits as well! This silky, scrumptious roasted butternut squash soup is my new favorite soup recipe! By roasting the veggies first and browning the wee bit of butter that we’re using for the soup’s creaminess, we’re able to infuse this tasty soup with so much extra flavor! Gah! Love it so!!! Roasted Butternut Squash Soup is a cold-weather staple! 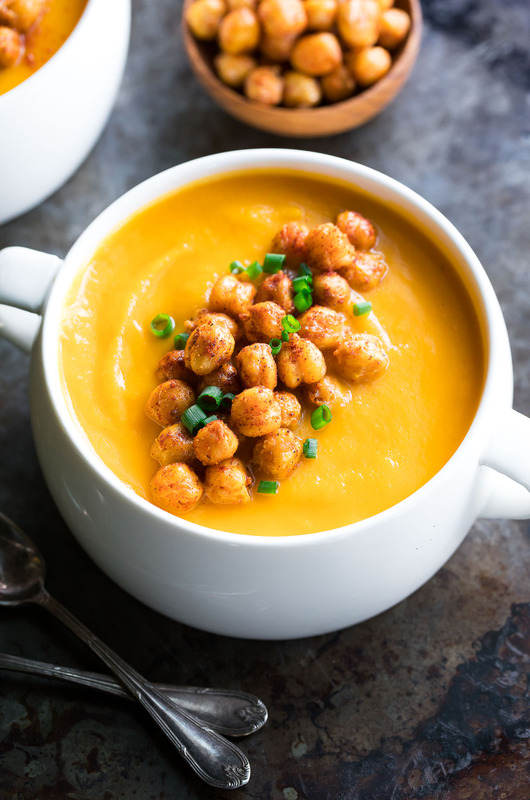 We love this silky butternut soup served with spicy roasted chickpeas for extra flavor. Vegan, Vegetarian, and T-Rex toppings available, so there's something for everyone! Recipe yields approx. 4 bowls or 6-7 cups of soup. Pre-heat oven to 375 degrees F. Make sure you have two large rimmed baking sheets handy as well as a blender. Drain and rinse your chickpeas and place on a stack of paper towels to dry a bit. The drier the chickpeas the crispier they'll get in the oven. Woot! Cut your squash in half lengthwise and scoop out the seeds. Pierce skin of squash a few times with a knife. Peel and cut your carrots into 3 portions. Peel onion and cut into 8 quarters. Place both pans on the center rack in your oven and roast. Chickpeas will be done at 30 minutes and the squash and veggies will be done after 45-55 minutes. 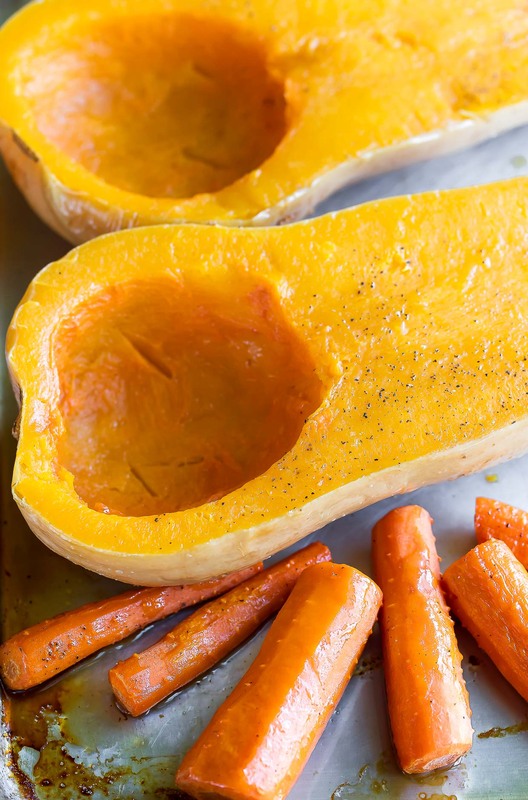 When squash is tender and can be removed from the skin easily with a spoon it's good to go! While your veggies roast, combine spicy chickpea seasoning in a small bowl: paprika, cayenne, garlic powder, cumin, black pepper. Set aside and once chickpeas are done roasting, sprinkle with the seasoning blend, mix 'em up, and set aside. They will crisp up more as they cool! In a medium-large pot, melt 2 TBSP butter over medium heat. For extra flavor, let's brown the butter first to add some nutty flavor to our soup! Let your butter melt untouched, then once it starts to simmer and brown, add minced garlic and whisk constantly until butter is golden and fragrant. Add your vegetable broth, cover, and reduce heat to low. Once your squash is ready, allow to cool enough t handle, then peel off the skin of the butternut. Alternatively you can scoop the squash out with a spoon. Working in batches, blend the veggies with the broth in your blender until silky. I was able to add half the veggies and half the broth and get it all blended in 2 batches. Filling blender only 2/3 full is best as hot liquid expands. Return the soup to your pot and mix well. Add any additional seasoning to taste and feel free to add extras like nutmeg, allspice, cayenne pepper, etc... If skipping the chickpeas (which have a LOT of flavor) you'll want to add extra seasoning to the soup. Keep covered over lowest heat setting until ready to serve. Dive in while it's hot and top soup with seasoned chickpeas and your choice of toppings from the notes below. I like mine with chickpeas, scallions and a teeny drizzle of cream! T-REX TOPPINGS: You're welcome to top the soup with crispy bacon if you're jonesin' for some. Vegetarians can opt for vegan bacon bits as well! Chicken broth may be used in place of veg broth if needed. For a vegan soup, replace the butter with oil, to taste. Using an immersion blender in place of a blender? Cut your carrot into smaller pieces for roasting (so they soften more and blend more easily) and make sure you're using an extra large pot to blend the soup in to prevent splashing. If you get a chance to try this roasted butternut squash soup, let me know! Leave some love in the comment form below or tag your photos with @peasandcrayons on Instagram so I can happy dance over your creation! Honey Roasted Butternut Squash with Cranberries and Feta <– READER FAVORITE! Butternut Black Bean Burgers <– FREEZER FRIENDLY! Amazing recipe. I have added it to my favorites list. Thank you for sharing. 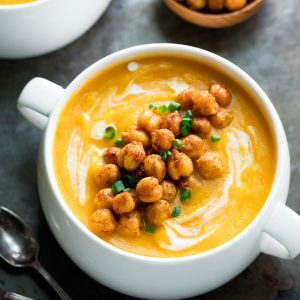 Loved this soup& the additional topping of chickpeas, how can I keep them crispy for the following days ahead? So glad you loved it Christine! The only way to keep the crunchy chickpeas is to use a dehydrator (thats how the pre-packaged ones stay so crunchy!) but I don’t have one of those so I’ve gotten used to them being less crispy and more chewy the next day when I heat up my soup. I actually like them both ways now! Keeping the chickpeas in an airtight container (room temp) with a paper towel on top can help keep them super fresh though! Hope that helps! Dang this was good!!! Those chickpeas are delicious. I would make just the chickpeas for a snack. I really loved this soup! Very good soup. But I was perplexed as to how to cut one onion into eight quarters. My husband & I both loved this soup. The spicy chickpeas were a fabulous addition. Thanks for sharing the recipe. It is now our favorite butternut squash soup recipe. Delicious! Will be keeping this recipe, loved the chickpea addition. It was nice for a change to have butternut squash soup without cream. Made this soup last night…what attracted me to making this soup and not the other thousands of other recipes is that you roasted all veggies! well, you didn’t ask to roast the garlic, but i threw it on the sheet pan whole and then pureed the whole thing together…I also loved that you suggested the toppings to go with this soup…i made the chickpeas, chopped green onion, and a little yogurt (we are not a vegan or vegetarian family–I just use vegan/vegetarian recipes because I like to pack in as much nutrition in as possible…just put this recipe in my permanent files! thanks! Love the addition of roasted garlic! So glad you enjoyed the soup Eva, thank you! Not sure I’ve ever had butternut squash soup but this recipe did not disappoint! Yay!!! So stoked to hear it Alivia, thanks! I had to add like 3 cups of fluid at the end. Not sure where I went wrong. Otherwise the flavour is great. Thank you! This was absolutely AMAZING!!! Perfect soup for that chilly day when you’re looking for a comfort food. Just the right amount of sweetness and the chick peas added the perfect spice. Jenn this has become my new favorite soup!! Thanks for the recipe. Thank you Deborah!!! I’m stoked you’re loving the recipe! 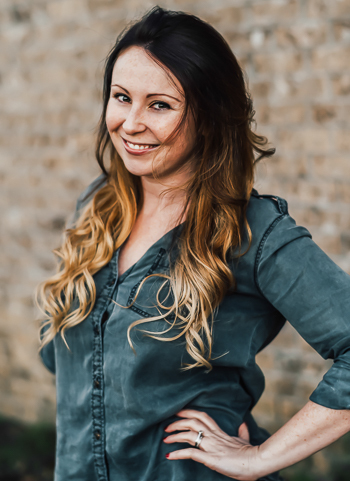 You knocked it out of the park, Jenn!! Delicious! Made this soup for dinner tonight…very yummy! Jenn, now that I’m retired, I’ve really been getting into cooking, and loving it! I subscribe to several food blogs and yours is one of the best! This is the second recipe I’ve made, and both turned out wonderful! I made this Butternut Squash Soup tonight and it was so easy abs ridiculously delicious. Thank you for sharing it!